Trump Tweets Congratulations To His "Deplorables" For "MASSIVE Landslide Victory" On Anniversary Of Election - Joe.My.God. President Trump congratulated his supporters on the Wednesday anniversary of his historic victory in the 2016 election, calling them “deplorables” in a nod to former Democratic opponent Hillary Clinton. 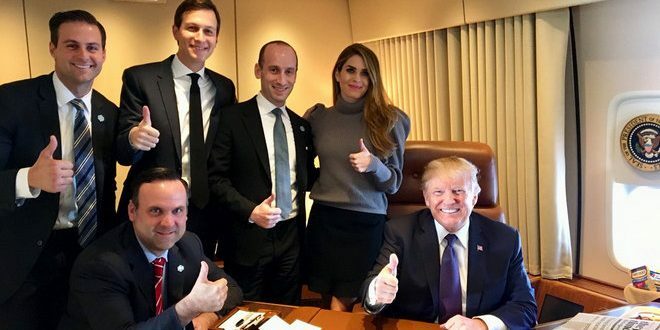 The anniversary tweet came attached to a photo of the president with key White House aides aboard Air Force One on Trump’s 13-day trip through Asia, including White House Communications Director Hope Hicks, senior policy adviser Stephen Miller and his son-in-law Jared Kushner.